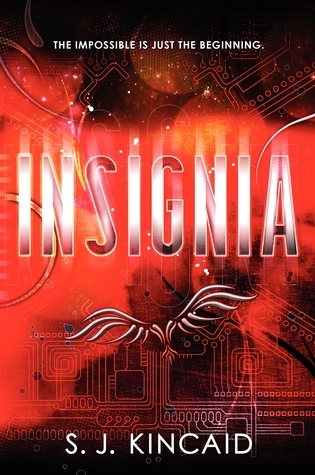 Insignia is a fast paced Sci-Fi novel with such incredible imagination, I want to dive into S.J. Kincaid’s mind to explore her creative artistry. Tom Raines has a real crappy life; never knowing where he is going to sleep from night to night. He has been pushed to enroll into an on-line reform school when the government found out when he was ten that he had never been to school. He “plays” people and bets to make money so he can stay in a hotel. Therefore, when a government official regarding his gaming abilities approaches him one day, he is made an offer he cannot refuse; To join an elite military academy to help fight in WWIII. Of course, when he agrees and finally persuades his father, he finds out that he was not informed of all the details of this academy. As Tom goes thru his training, he finds friendships, structure, and a feeling that he has a purpose in life…something he has never had before. However, his combat skills are different and harsh compared to everyone else. Will this project him forward in his career, or bring him down in total destruction? Even though Tom has been harden because of his upbringing, the friendships he has made means so much to him he will do anything to protect that loyalty. This story was INCREDIBLE! The plot, ingenious. The characters with all their different personalities and backgrounds, astounding. The humor, infectious. *Spicy Indian* Yeah, read the book for that one!! I found myself laughing out loud and picturing the goofiness in my head. The creative storyline, humor, loyalty, determination still baffles my mind. This Sci-fi adventure will captivate you with its extreme creativity, you will be begging for the next installment!! So, did I like it??? Well, DUH!!! Awesome review! I've never heard of this book but i'm adding it to my list. Thanks for the giveaway as well.